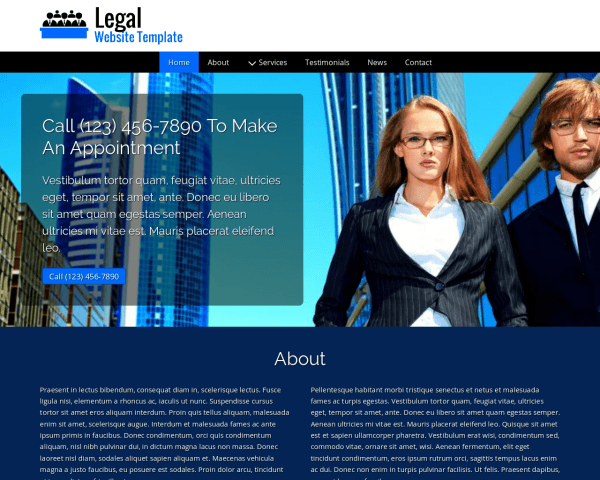 If you want to attract new clients, you need one of these Lawyer Pre-Made Website Designs. Equipped with multiple call-to-actions, a contact page, about page and a blog and much more, these themes are easy to use. You can even customize it to engage and attract potential clients. Start a trial website and watch as your business soar! 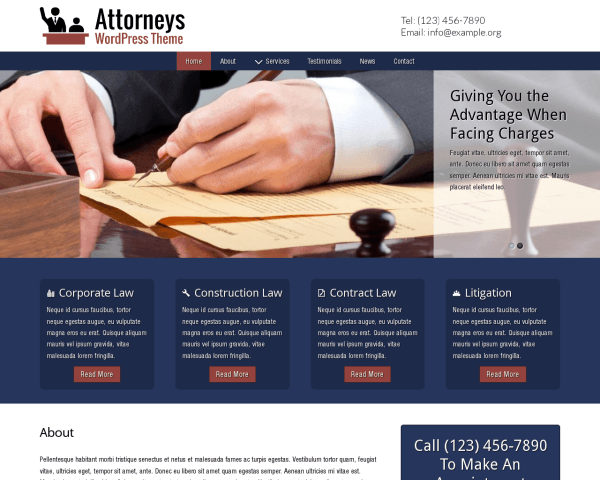 The clean, modern design of the Attorney Wordpress Theme extends to the mobile version of your website, so visitors will enjoy the same professional look and functionality of the desktop version while browsing on any mobile device. 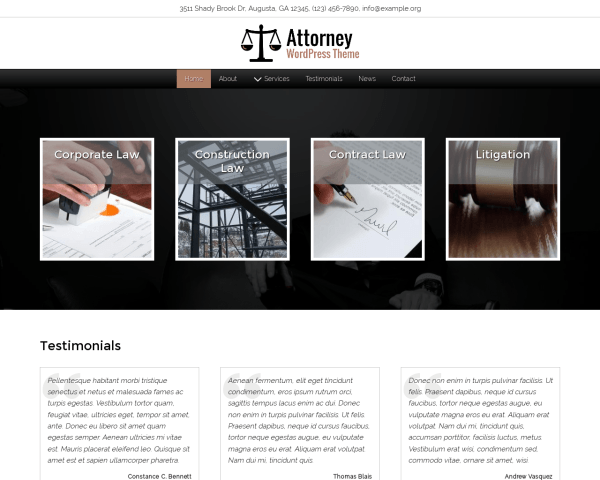 Featuring full-page image galleries, menus, and user-friendly navigation, this fully-responsive Attorney Wordpress Theme will automatically adjust the layout of your content to display beautifully on any size screen with no extra plugins or coding required. Mobile users can just tap on your phone number to dial! 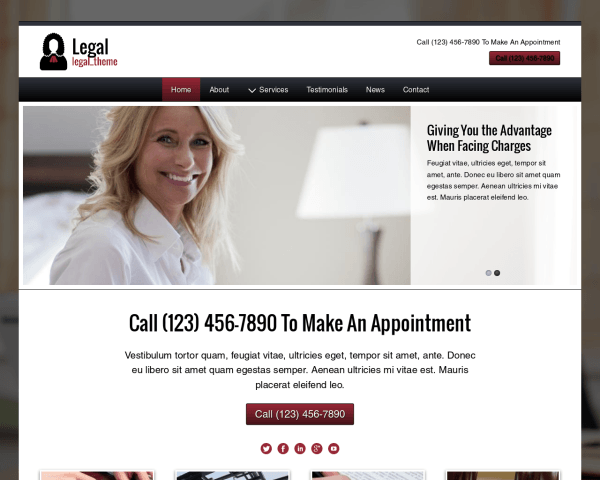 When you use our responsive Lawyer Website Template, you need not worry about whether your mobile visitors can access it. 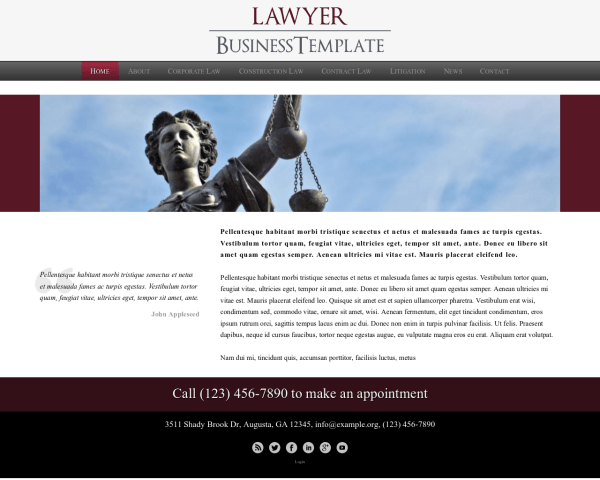 Our Lawyer Website Template makes it easy to engage clients, even when they are on the go. Because it automatically configures itself to whichever mobile device your visitors might be using, they will not be tempted to bounce away from your site due to a frustrating experience. 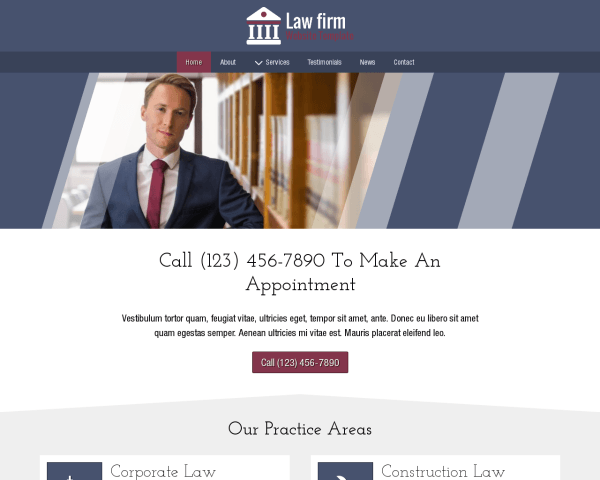 Treat your visitors to a great mobile experience when you build your website with the responsive Law Firm Website Template. Its mobile-optimized design will automatically adjust the layout of your content to fit any screen size, with no tedious coding or plugins required. With more and more people using smartphones and tablets to search online, you can be sure that visitors accessing the mobile version of your website on handheld devices will enjoy the same professional design, full-page photos and user-friendly navigation of the desktop version. Mobile-ready design is an ideal goal for any website, but when your business is all about your expertise, it's especially important that your online presence makes a great impression even on handheld devices. Power up your existing website, or build a brand new one with the responsive Legal Theme and rest assured that the mobile version of your site will offer visitors the same professional design, functionality and user-friendly navigation of the desktop version. Without any tedious coding or plugins, the layout of your content will automatically adjust to fit neatly on any screen size. It's important for your website to show visitors that you're up-to-date with the latest technology. 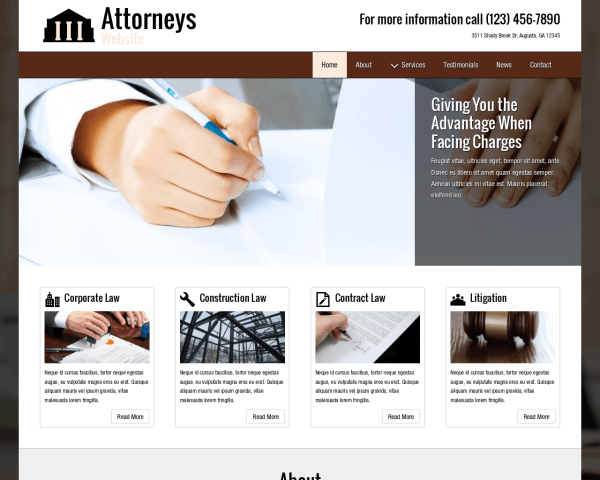 Make sure that visitors accessing your website on smartphones and tablets experience the same professional look and design of the desktop version with the responsive Attorney Website Template. We've built this premium website template with a mobile-optimized design that will automatically adjust the layout of your content to render beautifully on any screen size. Mobile visitors can simply tap on your phone number or a call-to-action button to dial. The onset of the mobile industry challenged the traditional way of presenting yourself online. More specifically, the need for a mobile optimized design placed complex requirements on the design and layout of any website. 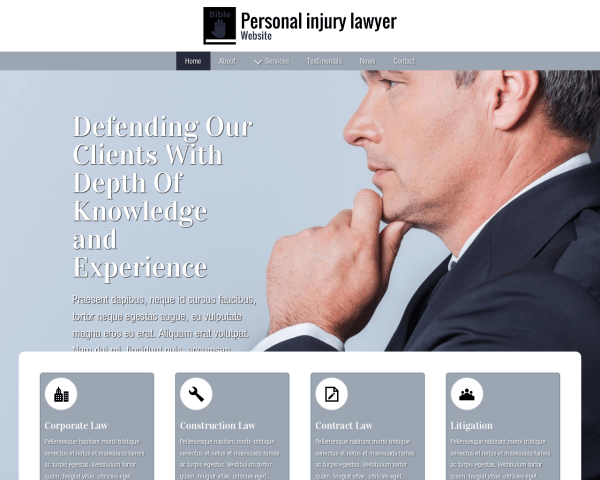 With this responsive Attorneys Wordpress Theme we've tackled one of the most difficult and most important aspects of any professional Lawyer website. Making sure your target audience get's the best user experience irrespective of device being used. 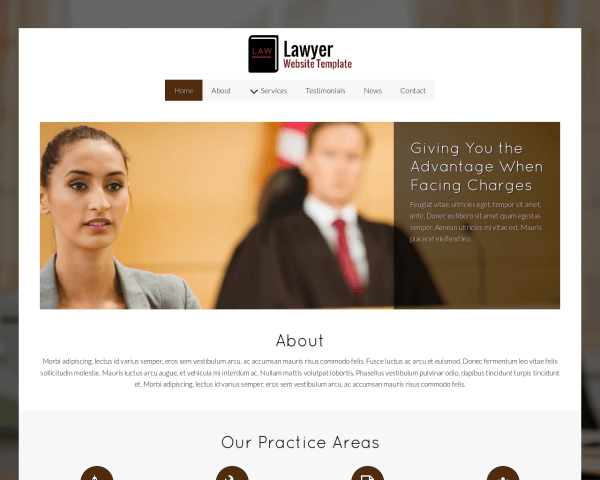 Clients accessing your website via smartphone and tablets will experience the same professional design, neat layout and intuitive navigation of the desktop version when you build your Lawyer website with the responsive Lawyer Wordpress Theme. Without any additional coding or plugins, its mobile-optimized design will automatically adjust the layout of your content to render beautifully on any screen size, across all mobile devices. Mobile visitors will enjoy the ability to tap on your phone number to dial or tap on your email to open a new draft. 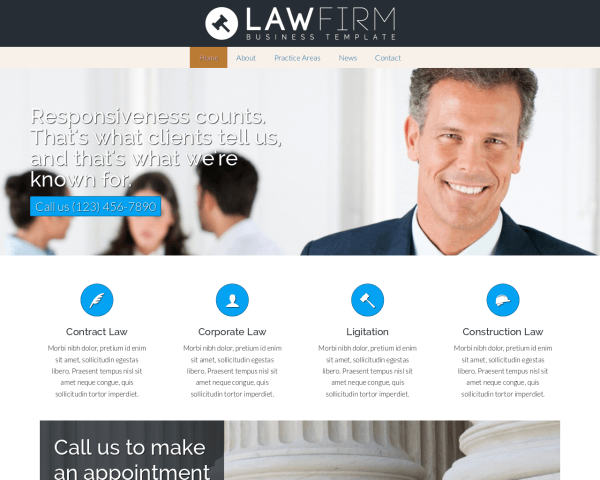 With this responsive Law Firm Wordpress Theme, your new website's polished look and powerful functionality will extend to the mobile version of your site. Visitors viewing your pages on smartphone and tablets will see the layout of your content adjusted to display neatly on any screen. Mobile visitors are able to simply tap your phone number to dial or tap your email to open a draft. No additional coding or plugins are required — our solid mobile-optimized design does the work automatically. 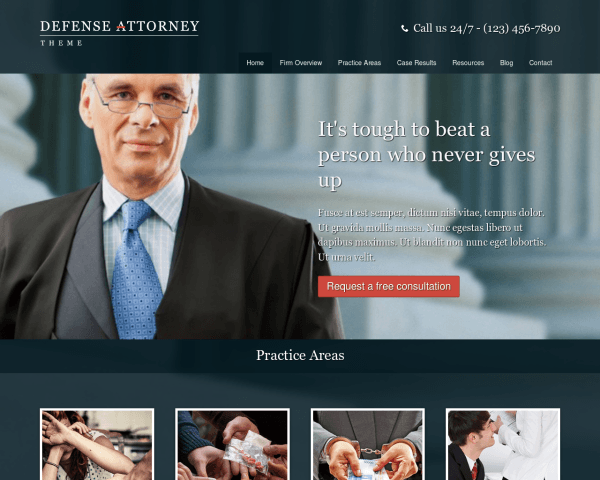 Ensure that all visitors to your Lawyer website enjoy a fabulous online experience when you build your site with the responsive Defense Attorney Wordpress Theme. Our mobile-optimized design will automatically adjust the layout of your content to display neatly with intuitive navigation on any screen size. Mobile visitors will be treated to the same gorgeous full-width photos and user-friendly functionality as the desktop version, plus the ability to tap your phone number to dial or tap your email to open a new draft. As you add new content, you can feel confident that your website is future-proof, sure to look great even on the latest mobile devices. Taking an ordinary theme or website and optimizing it for mobile devices is no easy task. But it's a very necessary one. More and more people are pre selecting companies, including yours, by taking the online road. If your Lawyer business isn't there, or lacks the professionalism portrayed by your competitors, chances are you could lose possible clients. 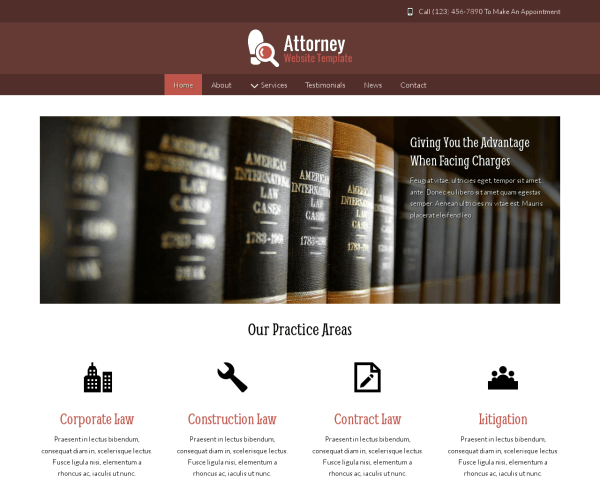 Not only is this theme geared solely for lawyers, it's also a fully responsive Law Office Wordpress Theme. All of the elements used will perfectly realign themselves to whatever screen resolution they are viewed on. It's your ticket to garnering new revenue streams through your online portal. You probably know how important it is for your website to make a professional impression even when viewed on small screens. 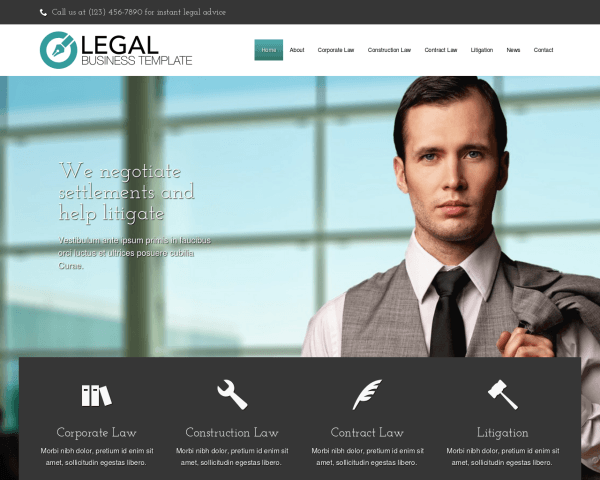 Right out of the box, the responsive Legal Wordpress Theme is built to offer mobile visitors the same sleek design and intuitive navigation of the desktop version. Our mobile-optimized design automatically adjusts to the screen size of any handheld device, without any extra coding or plugins required, and mobile visitors can just tap your phone number to dial or tap your email to compose a message. You can feel confident that your website will look great and work perfectly even as you add new content and as new types of mobile devices enter the market. 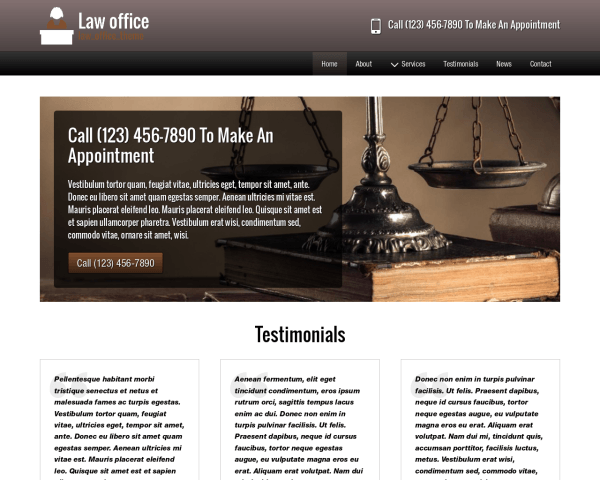 The Law Office Website Template makes it a breeze to connect with mobile visitors. The theme comes optimized for mobile devices. So without any additional effort, on your part - images, text and menus automatically adjust to fit your customers’ screens. This means more mobile visits, which in turn allows you generate more revenue. There's even a tap to call button that your customers can use to reach you from their mobile devices. You probably know how important it is for your website to make a professional impression even when viewed on small screens. 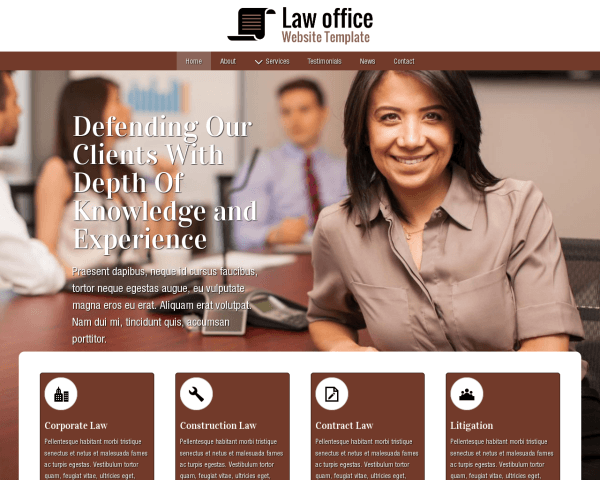 Right out of the box, the responsive Legal Website Template is built to offer mobile visitors the same sleek design and intuitive navigation of the desktop version. Our mobile-optimized design automatically adjusts to the screen size of any handheld device, without any extra coding or plugins required, and mobile visitors can just tap your phone number to dial or tap your email to compose a message. You can feel confident that your website will look great and work perfectly even as you add new content and as new types of mobile devices enter the market. Whether they visit your website from their mobile device or desktop, your visitors deserve a pleasant website experience. 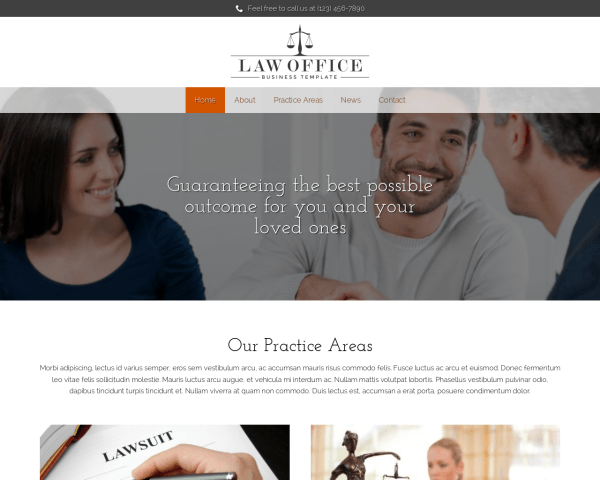 By helping you to meet the needs of your mobile visitors, the responsive Attorneys Website allows you to be found by more mobile users, which in turn will help you get more clients. Since the theme automatically resizes text, images, menus, footers and more to fit the visitor's screen size, you'll never have to worry about missing out on mobile visits again! 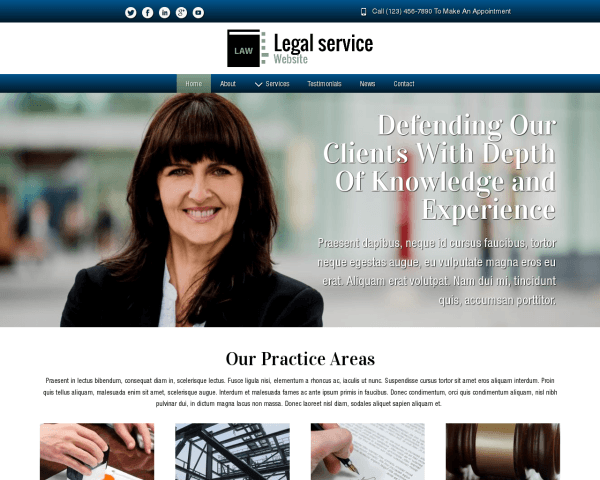 With this responsiveLegal Service Website you'll never have to give a second thought to the mobile version of your agency's website. Absolutely no coding, plugins or extra effort are required to ensure that your pages will display beautifully on any screen size. That's because our mobile-optimized design will automatically adjust the layout of your content based on the capabilities of each handheld device. Your visitors will be treated to the same professional look and functionality of the desktop version using any smartphone or tablet. One of the most important elements you want to convey to your clients has to be trust and professionalism. The main goal of the responsive Personal Injury Lawyer Website is just this. With this template you'll be assured of the fact that your website will show the best user experience irrespective of device being used. Where it's your business to convey trustworthiness and to utilize your highly specialized skillset, it's our business to integrate one of the most complex features in your website without you ever having to think about it. It's important for your website to show visitors that you're up-to-date with the latest technology. 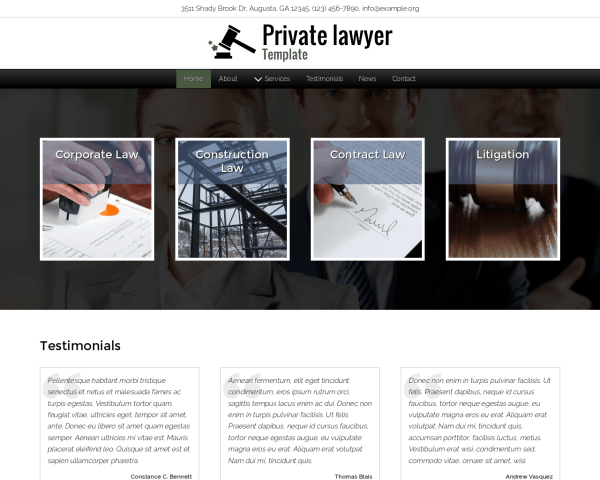 Make sure that visitors accessing your website on smartphones and tablets experience the same professional look and design of the desktop version with the responsive Private Lawyer Template. We've built this premium website template with a mobile-optimized design that will automatically adjust the layout of your content to render beautifully on any screen size. Mobile visitors can simply tap on your phone number or a call-to-action button to dial. Offer potential clients who are searching online a user-friendly mobile version of your website that looks great and works perfectly on any type of mobile device! 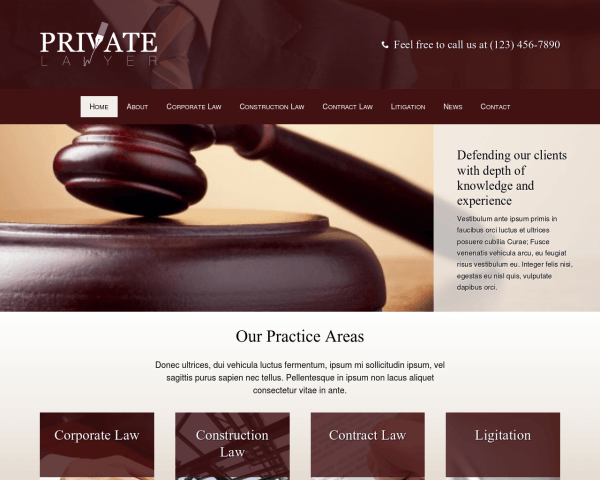 When you build your website with our responsive Private Lawyer Website, our mobile-optimized design will automatically adjust the layout of your content to display beautifully on any screen size, without any plugins, coding or extra effort required. Mobile visitors will enjoy the same professional look and functionality of the desktop version, together with responsive videos, photo galleries, and contact forms. Users can simply tap your phone number to dial or tap your email to send a message. Add an extra layer of trust to your online presence with a website that looks neat and professional at every screen size. 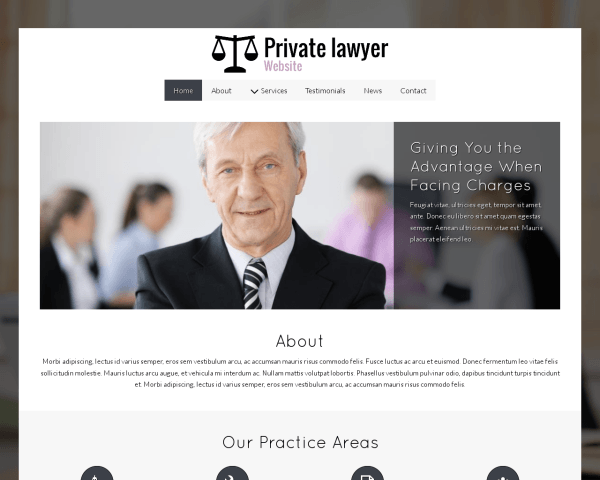 This responsive Private Lawyer Wordpress Theme is built to automatically adjust your pages to display beautifully even when viewed on smartphones and tablets. Mobile visitors can simply tap your phone number to dial just as they would while viewing your website on any laptop or desktop browser.